The HISD Board of Trustees met Monday to hear the first report from district administrators on expectations for the 2019-2020 fiscal year budget. District officials are projecting an initial $76 million deficit, due in large part to expected declining enrollment and a modest increase in property values – both of which cause the district’s recapture payment to increase. This entry was posted in Board of Education, Budget, News and tagged recapture, school finance on December 4, 2018 by HISD Communications. The Board of Education on Monday discussed proposed changes to HISD’s Resource Allocation System that address the district’s $115 million budget deficit for the 2018-19 school year. The changes include a reduction to the Per Unit Allocation (PUA), an increase in the small school subsidy, and the centralization of funding for Career and Technical Education. HISD faces a $115 million budget deficit for the 2018-2019 school year. To address the deficit, the district is proposing cutting $70 million from central office. Originally, the district proposed cutting $45 million from campuses, but that figure was reduced to $34 million by anticipating and assigning unspent funds from the 2018-2019 budget. This entry was posted in Budget, News and tagged 2018-2019 budget on April 2, 2018 by HISD Communications. The Houston Independent School District Board of Education on Thursday will consider a reduction in force for certain term- and continuing-contract employees. The board’s regular monthly meeting begins at 5 p.m. on Thursday, March 8, 2018 in the Manuel Rodríguez Jr. Board Auditorium of the Hattie Mae White Educational Support Center, 4400 W. 18th St. Click here to view the full agenda. This entry was posted in Board of Education, Budget, News on March 7, 2018 by HISD Communications. HISD Board of Education Trustees are scheduling meetings in their respective districts to discuss the district’s 2018-2019 budget deficit. Meetings may also address the difficult choices the district faces regarding improvement required campuses, HB 1842, and SB 1882. Questions from the audience are welcome. This entry was posted in Budget, News, Parents on February 26, 2018 by HISD Communications. As HISD continues to prepare a budget for the 2018-19 school year, the district anticipates a projected deficit reduction from $208 million to $115 million. This revised deficit includes several budget assumptions related to Hurricane Harvey relief and pending litigation. When HISD first began budgeting for the 2018-2019 school year, it was in the immediate aftermath of Hurricane Harvey. Using a worst-case scenario, the district’s financial team projected a $208 million deficit based on four dynamic factors: the Local Optional Homestead Exemption (LOHE) lawsuit, a recapture payment to the state, a potential property tax value decreaseand an anticipated student enrollment decline. District administrators crafted a revised budget outlook for the 2018-19 school year. The district’s legal team feels confident that the state will prevail in the LOHE lawsuit. 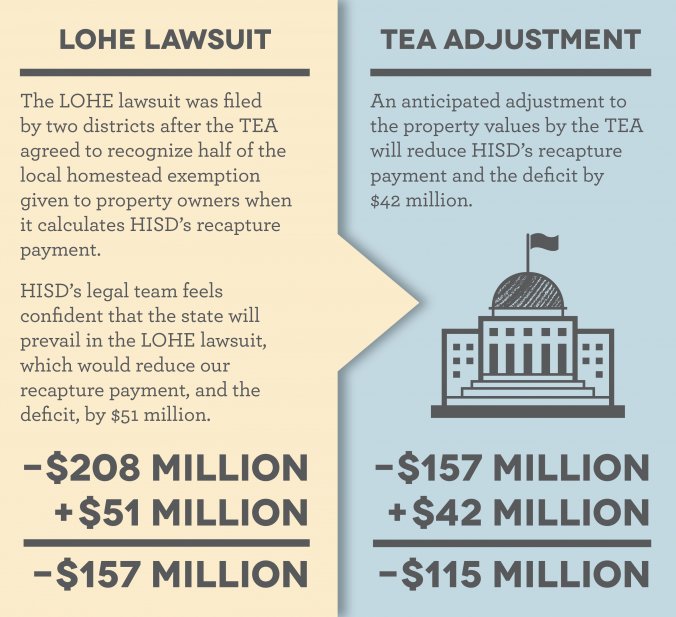 For HISD, this means a reduction in its recapture payment because the TEA will recognize half of the 20 percent local homestead exemption given to homeowners. A decision in the lawsuit could come after a hearing this spring. A win would reduce HISD’s recapture payment by $51 million. In addition, the HISD Board of Education favors a district budget performance review to be conducted by a firm that has previously worked with large school district budgets. An agenda item is anticipated for the April 2018 board meeting. If approved, an immediate audit would begin with a completion date set for the end of the year. This entry was posted in Board of Education, Budget, News and tagged 2018-2019 budget, Hurricane Harvey, recapture on February 26, 2018 by HISD Communications. HISD District IX Trustee Wanda Adams will discuss the district’s 2018-2019 budget during a community meeting at 6 p.m. on Tuesday, March 20 at Westbury High School (11911 Chimney Rock, Houston 77035). Trustee Adams will also discuss the difficult choices the district faces regarding improvement required campuses, HB 1842, and SB 1882. Questions from the audience are welcome. 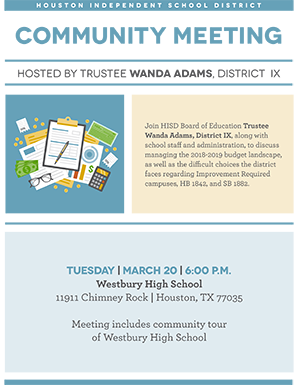 The meeting will end with a tour of Westbury High School. This entry was posted in Achieve 180, Board of Education, Budget, District IX - Wanda Adams, News on February 22, 2018 by HISD Communications. HISD District V Trustee Sue Deigaard will discuss the district’s 2018-2019 budget, and its effects on District V schools, during a town hall meeting at 7 p.m. on Thursday, Feb. 22 in the Bellaire High School auditorium (5100 Maple, Bellaire 77401). This entry was posted in Budget, District V - Sue Deigaard, News on February 16, 2018 by HISD Communications.